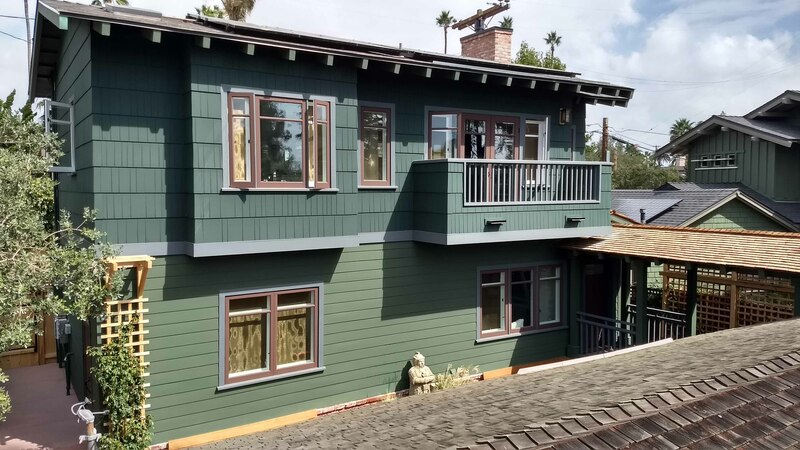 After adopting their first child, historic homeowners in Mission Hills, CA were ready to have a refreshed look with more space. Rather than expand their existing Arts & Crafts style home, they decided to replace the existing detached garage with a companion guest house. • A complete exterior restoration of 2,000 square foot historic home. • Light and bright master bedroom with fire place, custom craftsman windows, built-in bookshelves, and painted coffered ceilings. • Spa master bathroom complete with twin marble sinks, custom cabinetry, oversized VibrAcoustic bathtub, large subway-tiled shower with dual heads, 2 walk-in closets, and espresso bar. • Kid’s bedroom and bathroom on first floor with custom laundry shoot to garage. • Luxury 2-car garage with epoxy flooring, kitchen sink with bar, and recessed canned lighting. • Hardwood floors and custom moulding throughout the house. • Full design and landscape of residential garden sanctuary. • Interior design elements that balance craftsman architecture with contemporary accents. A home with over 100 years of history is now a fresh place to make more memories with a growing family.